Hi. I'm sorry to ask what is probably an answered question, but there are 47 pages of material here and I can't find a specific answer to my problem. There are a lot of images here, so it is tough to figure out which is the right one. I did the su and ./install.sh and I running on the emmc now. It works perfectly. I added the wifi line to my modules file and it worked. And when I click the two sample videos, they play in tiny windows nicely. Larger window videos don't play well at all. They hitch up and eventually crash the system. I had a similar problem on an rpi, and I had to manually compile mpv with hardware acceleration. But I can't find that this chip has that. I am trying to duplicate on an s905x TV box what I was able to do on an Opi H3 with Armbian. The ubuntu mate image works a little better with the video, but when I play a true fullscreen file it is doing the same start/stop. Updated the KODI-17.6 package for Ubuntu and added the KODI-17.6 package for Debian. Now these packages can be installed on any system (Server, ICEWM MATE\XFCE etc). If install KODI-17.3, remove all old packages starting with “aml -*”. to install all the dependencies. Thanks for answering so quickly Balbes. So I have to install Kodi for it to work? I am using mpv as a video screensaver with xscreensaver. Not using it as a media player. IR remote doesn't work anymore. Placed remote.conf in /boot/ and /etc/amremote without any effect. The amlogic-remotecfg service is not running, because /dev/amremote cannot be found. There are also no LIRC devices in case you've moved to LIRC for IR support. Running 1080p out of the box without adjustments after flashing: everything works fine. Kodi and desktop environment are running in 1080p. Changing 1080p to 720p after flashing and first boot: KODI works fine and runs in 720p, desktop environment shows artifacts and seems to be running in 1080p. Changing 1080p to 720p after flashing and before first boot: everything works fine. Kodi and desktop environment are running in 720p. Same effect when running the image from SD and USB stick. Maybe I'm doing something wrong. Can't get remote working on mate 20171226 either (which worked fine before). Perhaps I'm forgetting something. When are you guys going to build an special version for S905w with cvbs compatibility? The remote works in the image 20180305, you need to use the correct dtb file. It is a complex system (DE + KODI). To change the screen resolution ONLY in the file /boot/hdmi.sh. That's right, I just copied the dtb without renaming it. Sorry the wrong report. One last thing, I don't know you can fix it, but there seems to be some problems with the amlogic audio drivers. Maybe there are alternatives or fixes available? Audio driver can cause kernel panic when playing a sound rapidly multiple times in a row. No audio is available after the kernel panic, or it keeps playing (loop) the audio in the sound buffers before the kernel panic. Start up Kodi. Use the keyboard to navigate through the menu, so it plays a sound every time it selects a different menu item. Now quickly navigate through the menu. Mini M8S II (s905x) using GXL P212 2G DTB. Using your Ubuntu Mate image. Versions 20171226, 20180305, and 20180307 are affected. Remove "alsa-utils" and "libasound2-plugins" (with all dependencies). This is a problem of interaction between the new kernel and pulseaudio. If you do not use pulseaudio - you can completely remove it. @balbes150 thank you amazing work. Your armbian 3.14.29 works very well on s905w (x96 mini 1GB/8GB), only wifi no luck. I am confused how to add support to your image. Maybe you support already I just don't know how to enable. I think the other changes to the kernel config are needed. but seems old (different branches now). @deranger can I ask you for directions on which dtb file for that? I have the 1/8 variant of an s905w with wifi only working on a LE build. tried many dtb files. Is it possible to compile Hyperion to use the Ambilight backlight in the Armbian for S905X? this one works fine with the khandas vim 1 but what is the root pwd ? Judging from many of your messages with different problems, you have a problem with media quality or image recording. The forum has been the description of a similar problem from a user who tried to understand. As a result, he solved all the problems after replacing the media with high-quality ones. I'm using samsung and sandisk sd card tell me what is better quality media ? Start by reading from this post and then on the next page. A few posts you will see what kind of result came user. I tried to install Armbian_5.41_S9xxx_Debian_stretch_4.9.40_server_20180315 but all my attempts are unsuccessful. My usb key seems to boot (blinking led) but i have no HDMI output nor any IP adress on my network displayed. I tried several P212x dtb.img but none work. Can anyone give me a hint to make 4.9.40 server boot on my 2 devices? Did i miss something? Or just recommend me 2 dtb for S905X (1Gb & 2Gb) working with Balbes 5.41_59 2018015 img? 1. New u-boot (it is used in firmware from Android-7). @balbes150 i'm trying to run Kubernetes using your kernel, but it seems to lack some cgroup support such as freeer, and other kernel support for ip_nf and netfilter_xt. 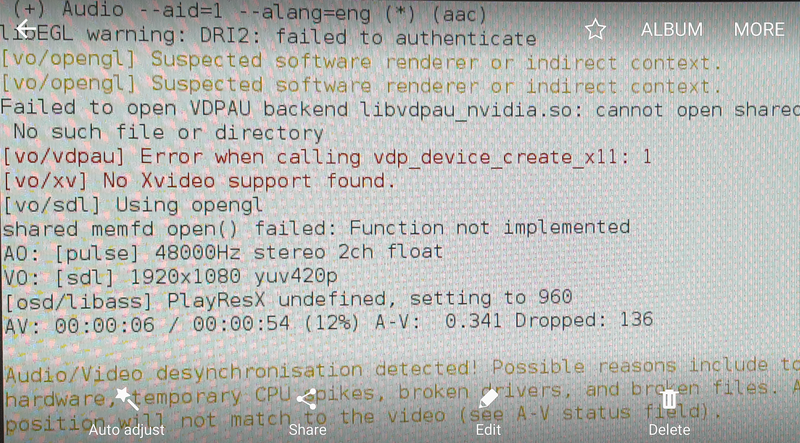 + some other missing kernel support too, please see below marked in bold. Possible to get these into the next version? root@amlogic:~# kubeadm join --token 82e7a9.543a20d2e1b46566 192.168.1.105:6443 --discovery-token-ca-cert-hash sha256:030150ccecdfd2139bd3f532b92153870ea01f9cf319b1fb8954dab76357fb45[preflight] Running pre-flight checks. CONFIG_AUFS_FS: not set - Required for aufs. CONFIG_BLK_DEV_DM: not set - Required for devicemapper. I have successfully installed and run different images with 3.14 kernel on my MXQ Pro+ 4K (S905X Mali-450 2GB/16GB) box. 1. when trying to watch flash videos -like Youtube- on browsers (Chromium, Firefox), in fullscreen mode the image is stuttering and pretty unwatchable (on sports events, for example, where action should run smoothly). The small default window runs fine, only fullscreen is problematic. 2. Kodi 17 is rendering smooth image but it is always in fullscreen mode and cannot be modified to windowed mode. Therefore I cannot copy Ace stream or Sopcast links in order to paste and play them on Kodi's Plexus addon. I am new to Armbian/Linux and I don't know whether these video issues are solvable. Am I missing something? In any time soon I is engaged in a and not plan significant changes in kernel. You can build your own version of the kernel for yourself. Image update Armbian 20180323 kernel 4.14.11 . Works wired network, USB, monitor (you can change the screen resolution on the fly). The images are in the "test"directory.